This is an unrecorded letter, found in a private collection, from Albert Einstein, in which the theoretical physicist wrote of his religious beliefs. This is the back side and closing of the letter. 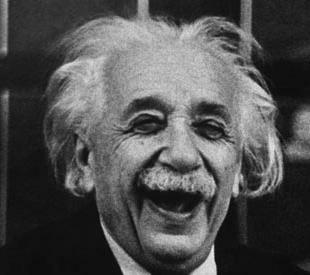 "The word god is for me nothing more than the expression and product of human weaknesses, the Bible a collection of honourable, but still primitive legends which are nevertheless pretty childish"
Einstein was Jewish but went to a Catholic primary school, receiving private tuition in Judaism at home. He declined the offer from the newly formed state of Israel to be its second president. 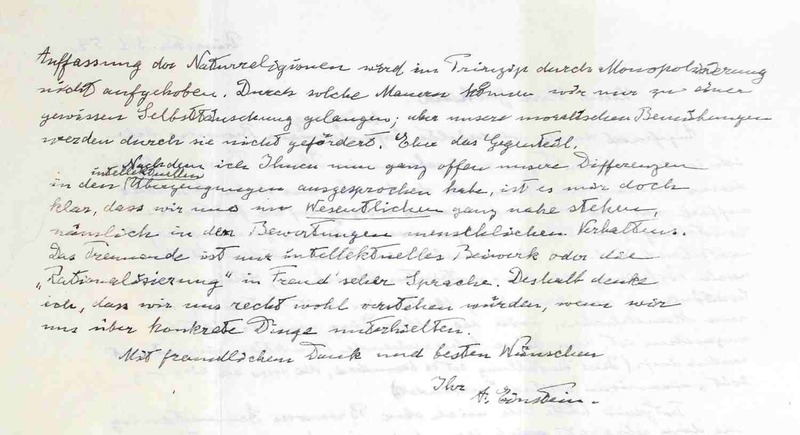 In this letter, which was written in German the year before his death, Einstein wrote, "For me the Jewish religion like all others is the incarnation of the most childish superstitions. And the Jewish people to whom I gladly belong and with whose mentality I have a deep affinity, have no different quality for me than all other people. As far as my experience goes, they are no better than other human groups, although they are protected from the worst cancers by lack of power. Otherwise I cannot see anything ‘chosen’ about them"
Although Einstein emphatically rejected conventional religion, he was affronted when his views were appropriated by atheists, whose lack of humility he found offensive, and once wrote. "The eternal mystery of the world is its comprehensibility." Einstein was an intensely spiritual man and wrote extensively on the subject, perceiving a universe suffused with spirituality, while rejecting organized religion. In his later years he referred to a "cosmic religious feeling" that permeated and sustained his scientific work. In 1954, a year before his death, he spoke of wishing to "experience the universe as a single cosmic whole". He was also fond of using religious flourishes, in 1926 declaring that "He [God] does not throw dice" when referring to randomness thrown up by quantum theory. Like other great scientists he does not fit the boxes in which popular polemicists like to pigeonhole him. It is clear, for example, that he had respect for the religious values enshrined within Judaic and Christian traditions ... but what he understood by religion was something far more subtle than what is usually meant by the word in popular discussion. Einstein’s numerous and easily found pronouncements on the issues of God, faith and religion have revealed him to be the sort of peculiar hybrid not uncommon in scientific fields. No atheist, Einstein nevertheless characterized the notion of a personal and interactive God as a prideful one. The discoveries wrought through his curious mind reminded him, always, of all he did not know, and he wrote of the “superior spirit” and the “harmony” that connected and ran through everything with a genuine sense of wonder that could be described as a rather humble agnosticism. …Auffassung der Naturreligionen und im Prinzip durch Monopolisierung nicht aufgehoben. Durch solche Mauern können wir nur zu einer gewissen Selbsttäuschung gelangen; aber unsere moralischen Bemühungen werden durch sie nicht gefördert. Eher das Gegenteil. Nachdem ich Ihnen nun ganz offen unsere Differenzen in den intellektuellen Überzeugungen ausgesprochen habe, ist es mir doch klar, dass wir uns im Wesentlichen ganz nahe stehen, nämlich in den Bewertungen menschlichen Verhaltens. Das Trennende ist nur intellektuelles Beiwerk oder die „Rationalisierung“ in Freud`scher Sprache. Deshalb denke ich, dass wir uns recht wohl verstehen würden, wenn wir uns über konkrete Dinge unterhielten. English translation of a more complete portion of the letter..
Now that I have quite openly stated our differences in intellectual convictions it is still clear to me that we are quite close to each other in essential things, i.e., in our evalutations of human behaviour. What separates us are only intellectual 'props' and 'rationalisation' in Freud's language. Therefore I think that we would understand each other quite well if we talked about concrete things.